It’s been a little while since Techgage last took a look at a notebook, with the previous one being ASUS’ excellent UX305 ultrabook. For this article, we have something a bit special. That’s because it’s the first notebook we’ve ever had in from Eurocom, and believe me, the Monster 4 is a great place to start. While Eurocom’s name might make it sound like it’s based in Europe (something 100% of the people I’ve polled thought), it’s actually based in the Great White North – Canada, for those who might think I mean the North Pole. From its Ontario headquarters, Eurocom creates a hard-to-number amount of notebooks, which includes some of the most ridiculous (as in ‘amazing’) ones I’ve ever seen. Take for example its recently launched Sky X9, a notebook that can be equipped with both a desktop CPU and GPU. While the Monster 4 I’m taking a look at here isn’t quite the powerhouse the Sky X9 is, it’s hardly a slouch, either. In fact, “slouch” shouldn’t appear anywhere near this notebook, as it sports both a high-end quad-core Intel Core i7-6700HQ and NVIDIA GeForce GTX 970M graphics card. Right off the bat, you know that this notebook means business. Well, business and gaming. Unlike most notebooks we’ve taken a look at in the past, the specifications for the Monster 4 are not written in stone. The base configuration is $1,292, and includes most of what our sample does; the main differences is that ours has a 128GB M.2 SATA-based SSD, as well as 16GB of memory (versus 8GB) and 1TB of storage (versus 500GB). Our sample as tested is priced at $1,528. It’s worth noting that this notebook can be equipped with either a SATA or PCIe-based M.2 SSD, and while our sample included a SATA-based one, we’d encourage paying a bit extra for a PCIe one if you are able, as they can be upwards of 4x as fast. Further, all Eurocom notebooks can be shipped without an operating system, potentially saving you time and money. If you do want Windows preinstalled, you can choose between Windows 7, 8.1, and 10. Since our notebook sample didn’t ship with an OS, we performed all testing using Windows 10 Pro 64-bit. 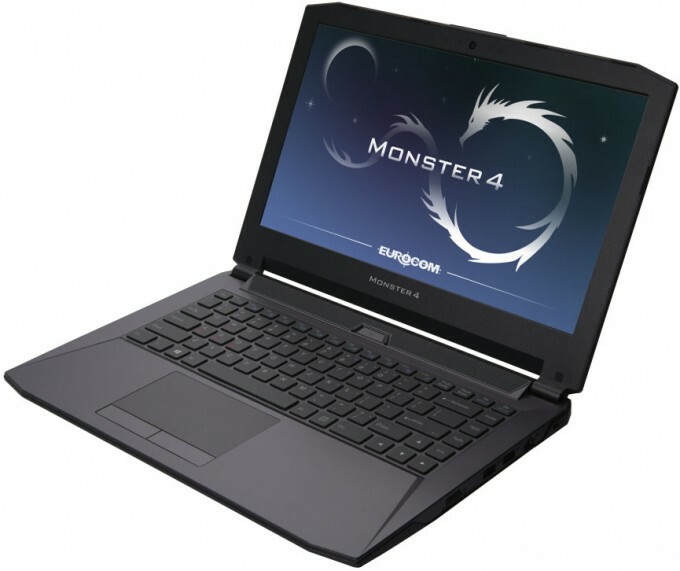 As powerful as the Monster 4 is, Eurocom considers it to be an “ultra portable” thanks to its 14-inch form-factor. It’s actually interesting that Eurocom sent a 14″ model, as I purchased a 14″ ASUS notebook a couple of months ago and have come to appreciate the form-factor. I like 13-inch notebooks because of their overall size, and 15-inch ones because of the extra breathing room (and sometimes the addition of a numpad). 14-inch, though, meets me right in the middle, and makes not having the benefits of 13- and 15-inch notebooks easier to bear. At 4.4lbs, the Monster 4 isn’t as light as most Ultrabooks, but this isn’t an Ultrabook: it’s a mobile workhorse. The Monster 4 has a speaker bar right above the keyboard, delivering what I felt to be great sound (“from a notebook”), but nothing is going to compare to a good set of headphones. And speaking of headphones, you might just need them, because as I found out, high-performance gear in a small notebook can result in quite a bit of noise. More on that later. There’s really not too much that can be said about a notebook keyboard and touchpad, and the same applies with this notebook. But, I can say that the touchpad is one of the best I’ve used in a while for moving the cursor around, though the left and right buttons didn’t feel quite as satisfying to click as I would have liked (a personal preference). I have no complaints about the keyboard, however; it was a pleasure to type on. On both sides of the Monster 4 are two USB 3.0 ports, and on the left, those are complemented with dual mini-DisplayPort connectors. Also on the left side is an HDMI port and three audio connectors. On the other side, there’s a card reader, Ethernet port, and also a Kensington lock. Aesthetically, I don’t think the Monster 4 is a “great looking” notebook, but that’s something that can be debated. I do love the look of the notebook when it’s opened up, but the hood’s aesthetics don’t really grab me. It definitely looks like a workstation, though, so I can give it that. A design choice I find a little odd here is with the power port; it’s right in the middle of the back, and can cause the power cable to get in the way of the exhausts. This wouldn’t be an issue if the power cord included was straight at the end, but that’s not the case. Instead, it has an angled end (as can be seen in a shot above), which means that unless you happen to get the power cable to point straight up, it’s going to be hanging to the side, causing it to block some of the exhaust. Personally, I like to give my notebooks as much room to breathe as possible, so it doesn’t give me a great feeling when I am forced to have a cable run alongside a portion of the backside. That complaint aside, a great thing I can say about the Monster 4 is that it’s very durable, and feels like quality. You can feel that this notebook was designed for important workloads, which I guess in this case can include gaming. I have few complaints about the design itself overall; most minor complaints are tied to personal taste. Because Eurocom doesn’t install an OS on its notebooks by default, and likewise doesn’t include any sort of unique software solution, that makes my job just a wee bit easier. However, because this is a gaming notebook with a great GPU, I tested some games out with an external monitor as well, since the GeForce GTX 970M can handle 1440p resolution gaming pretty well. With that, let’s jump into a look at 1080p gaming on this notebook.